With Islamophobia At Flood Tide, American Muslims Grapple With Suspicions The rise in anti-Muslim rhetoric has left many Muslims in New Jersey frustrated and frightened — and prompted Muslim community leaders to explain their religion and reassert their loyalty to the U.S.
A person walks to Friday Prayer at the Omar Mosque in Paterson, N.J. in 2012. With Islamophobia surging in recent weeks, many Muslims in Paterson say they are feeling frightened and unsettled. "It makes me feel deeply hurt," says Abdallah Issa, who immigrated to the U.S. from Jordan 30 years ago. Now he owns a business delivering pitas to stores and restaurants across New Jersey and New York City. "I consider this as my country. I'm an American citizen, and I have a lot of love for this country. Because the opportunity I got here, I never found anywhere." It's been a difficult time for Muslims across the country. 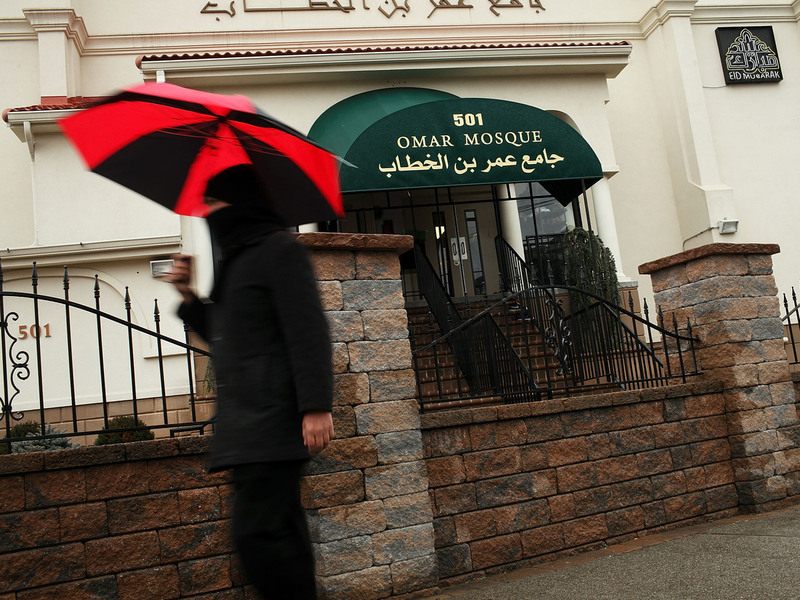 Community leaders say Islamophobia is at its highest level since September 2001. That's prompted feelings of fear, anger and disappointment among many of Paterson's roughly 30,000 Muslims, and tens of thousands more scattered across suburban North Jersey. Their families came from all over the world, including Bangladesh, Egypt, Syria, Jordan, Turkey and the Palestinian territories. But many were born here. "We are regular Americans," says Al Abdelaziz, who is running to be the first Muslim city councilman from South Paterson. "I don't know any other country in the world." For many Muslims here, the American Dream has actually worked. They've become doctors and lawyers and business owners, raising their families in comfortable middle-class suburbs. Which may be one reason why Trump's comments — and the flood of Islamophobia they've unleashed — continue to rattle these communities. "We are shocked," says Mohamed El Filali of Elmwood Park. "We are not surprised at the Islamophobia. But the openness — and how it's conducted and how it's condoned by certain elements of our society — is very sad." Muslim leaders say there have been just a handful of documented incidents of harassment in New Jersey. But people talk about personal interactions that are difficult to report — like bullying in the school locker room, or lingering, suspicious glances at women who wear the headscarf known as a hijab. "I'm so scared. I get scared to leave the house at night," says Bayan Abbasi of Hackensack. "I get so scared, I think that I can't drive alone with my daughter. If I'm driving and I want to switch a lane, I'm careful in case the person driving the car sees me wearing the hijab and gets very angry." Donald Trump has repeatedly claimed that he saw "thousands of people" in New Jersey celebrating on Sept. 11, 2001. Community leaders here say that simply didn't happen, and local law enforcement officials agree. But even without evidence, the rumor persists. "I think it tells a lot of us that we have to work a lot harder," says Salaheddin Mustafa, a member of the Islamic Center of Passaic County, a prominent mosque in Paterson. "It's very frustrating when it's framed as if the Muslim community either has one of two choices," says Mustafa. "It either has the choice of being a good American, or supporting ISIS. That's such a false characterization. It's a fringe of a fringe that has nothing to do with who we are." Mustafa is confident there will be a time when American Muslims aren't constantly asked to prove that they are loyal Americans, when they'll be fully accepted, like many other immigrant groups before them. But that dream seems further off than he hoped.